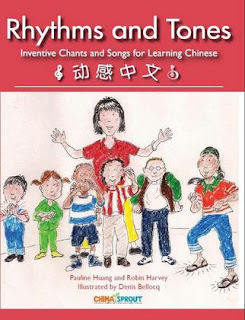 One of the things that we prioritized when creating our new Chinese language learning book and CD set, Rhythm and Tones, Inventive Chants and Songs for Learning Chinese, was the ability to use it both in the classroom and at home. In order for language learning to be successful, it is important that children get as much exposure to the language as possible. The songs used to teach words in Rhythm and Tones are catchy and easy to sing, which make it easy to incorporate Chinese language learning into every day life. We created the book so that it could easily be used both as guided coursework in the classroom and at home for self-study. The textbook is straight-forward enough that parents, without any formal knowledge of Chinese, can use the book to teach their children Chinese words, phrases, numbers, and even basic principles of the written language. Chinese teachers can take the textbook's simplified format to the next level by challenging the students with games and questions that cause the students to think more deeply about what they are learning. Listen to the song or chant. Do you recognize any words? You might hear the names of children, or phrases from earlier songs. Begin to put together the meaning. Read along. You will see that each character is one spoken syllable. (Sometimes two or more characters join to form a word.) Explore the beauty and logic of Chinese characters through radicals searches. Play along! Small xylophones and percussion instruments enhance the rhythms and allow us to immerse ourselves in the music, forgetting that we are learning language. Practice pronunciation naturally. Our chants emphasize the natural speech patterns and four tones of Chinese, which are introduced in chapter, The Four Tones Chant. Try Tones Yoga and move your body with the tones. Play the language-based games we suggest. Try out different roles as you sing and chant. Act out the songs or chants. Play and learning are not mutually exclusive! Take advantage of the karaoke versions on the CD and musical scores in the back of the book. Use the original lyrics, or make up your own! What are some of your suggestions for using Rhythm and Tones to teach Chinese language? I spent the last few months working to produce a new ChinaSprout published book and music CD called Rhythm and Tones, Inventive Chants and Songs for Learning Chinese. I am very excited to share this set with our customers, because I believe that it fills an important need in Chinese language education -- making learning fun! The number of students learning Chinese is on the rise. But, the complaint that I hear most from Western students, parents and even teachers is that the typical Chinese classroom environment is too rigid to keep students interested. That's why I jumped at the chance to work with Pauline Huang and Robin Harvey. These two talented teachers put their lessons to music, and brought fun back into the classroom. "We love teaching Chinese with music and rhythm, and the children we teach love it, as well," Robin says. "When we sing, we are relaxed and receptive. Research shows that this is a key to language learning. Lyrics are naturally repetitive, another key, and they run through our heads while we go about our day. In fact, I still sing the song that my Latin teacher taught in 11th grade, "sum es est." Before they met, they each used chants and songs to teach Chinese. Robin was inspired by Carolyn Graham's "Jazz Chants," and Pauline by her musical background. One day, Pauline wrote the song "I'm Hungry"(肚子饿了) for their classes. The two then worked together to focus the language for their students. After that, their collaborations continued. In mid-November, we showcased Rhythm and Tones for teachers at the 2010 American Council on the Teaching of Foreign Language (ACTFL) conference. The positive response that we received was incredible! Everyone who walked past our booth would stop when they heard the chants and music. Most of the Chinese language teachers we spoke with bought the set. They loved it because of the rhythms, the simple, repetitive words and the fun music. Many teachers said that this was exactly the sort of teaching tool that they had been seeking for a long time. Many of our ChinaSprout customers are looking for Chinese language tools that they can use to help their children at home. With this in mind, we created the Rhythm and Tones set so that it has a life outside of the classroom. Kids and parents can easily work together through the textbook to learn words, sentences and even radicals. Plus, the accompanying CD is filled with songs that families can listen to and sing along with while at home or in the car. There are so many ways to use this set, both in the classroom and at home. I will share some suggestions and video in the next few days. 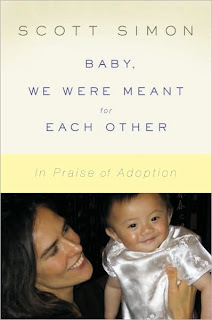 Baby, We Were Meant for Each Other is a celebration of adoption, written by broadcaster Scott Simon. The book provides an intimate and heartwarming look at Simon and his wife Caroline's adoption of two girls from China, whom they clearly love deeply. Their struggles with infertility, their adoption journey and their daily challenges of raising two strong, independent young girls are all covered with the wink and a smile delivery that one comes to expect from listening to his NPR show, "Weekend Edition with Scott Simon." For anyone who has adopted internationally, Simon's stories of his family's adoption trips to China will bring back memories. The hotel room banter of nervous parents trying to win the affections of a child, who wants absolutely nothing to do with them, will not be unfamiliar. The raw emotions that accompany this heart wrenching journey to family are practically universal. The moments are fun to re-live with him again. And, he tells of these moments in a way that does not mask the pain, but that makes us laugh at the absurdity of plying our children with warm baths and noodles. Our goal is to show our children that we can provide for them, and that they can love us, because we truly love them. However, that trust has to be earned over long periods, often times again and again. The unique challenges that adoptive families face do not end when our children have reached a point of seeming calm. In addition to sharing his personal insights and experiences, Simon seeks out others whose lives have been touched by adoption. In a world where the media loves to call out adoption status when associated with serial killers and psychosis, Simon introduces the reader to a host of well-adjusted and downright happy adoptees. This is not to say that he makes light of the challenges or heartache that some of these individuals and families face. He chooses, instead, to focus on the positive, on the tenacity of the human spirit and of people's capacity for unconditional love. In its whole, Baby, We Were Meant for Each Other is a love story. It is Simon's ode to his family, and it truly is a celebration of adoption. I struggled with this book and its "love conquers all" theme. At one point, when discussing the primal wound adoption theory, Simon says " I think that the love my wife and I give our daughters can help bind whatever wound they have and make them strong." I've seen first hand when love isn't enough in adoption. I wish he would have given more credence to the reality that abandonment can hurt our children very deeply -- to a point where our love can't always fix it. However, as a friend recently pointed out to me, as adoptive parents, we often spend our time reading about "when things go wrong," so that we can avoid or amend these issues. Simon's book is a celebration of all that can be right with adoption. And if it leaves you with a warm heart and a smile, well, that's not such a bad thing.